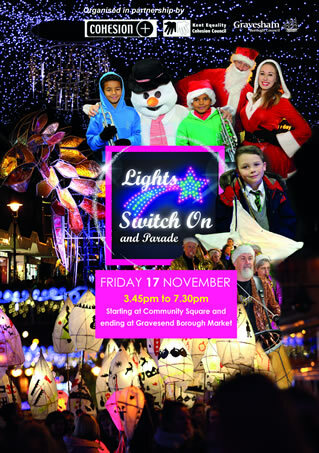 Cohesion Plus working in partnership with Kent Equality Cohesion Council and Gravesham Borough Council supported by Arts Council England have organised the Gravesham Festival of Christmas Lights which will take place on Friday November 17th between 3.45pm and 5.30pm. The town centre event will be kicking off from 3.45pm. Crowds can expect street entertainers including a Jack Frost themed mime artist, Santa and his helpers on stilts, Bloco Fogo Samba, Brass Volcanoes and the Drumming Santa’s. 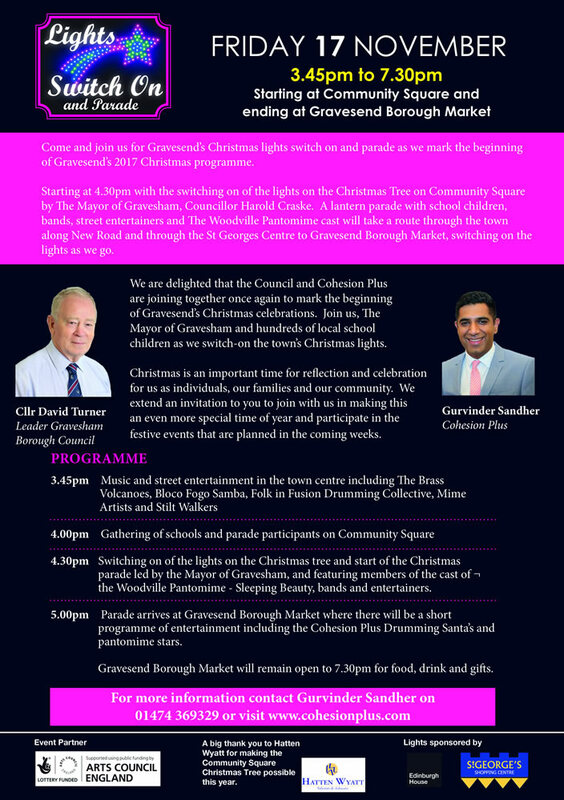 Around 500 school children from 10 local schools will then take part in a lantern parade led by the Mayor of Gravesham Councillor Harold Craske, which will start at Community Square at 4.30pm with the switching on of the Christmas tree lights. The schools have been working with Same Sky Arts on Christmas Lanterns which they will showcase during the parade. The parade will then go via Windmill Street, New Road, through the St Georges Shopping Centre before finishing at Gravesham Borough Market. 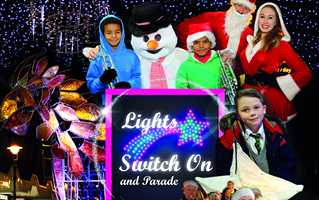 The Christmas Lights will be switched on in the Town Centre as the parade passes. The celebrations will climax with a series of performances including the stars of this year’s pantomime Sleeping Beauty. 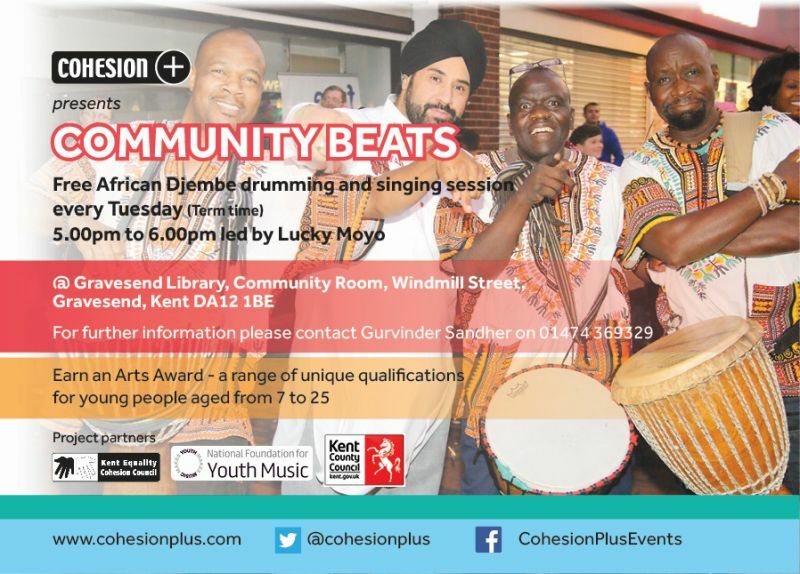 The Cohesion Plus produced “Drumming Santa’s” will be also performing in the Town Centre and the Gravesham Borough Market led by Lucky Mayo and Billy Singh. The Drumming Santa’s will be bringing a unique fusion of Christmas tunes, Bhangra and African drumming to entertain and wow the crowds. Gurvinder Sandher the Artistic Director of Cohesion Plus commented “We are really looking forward to the Christmas Parade and Light switch on this Friday. 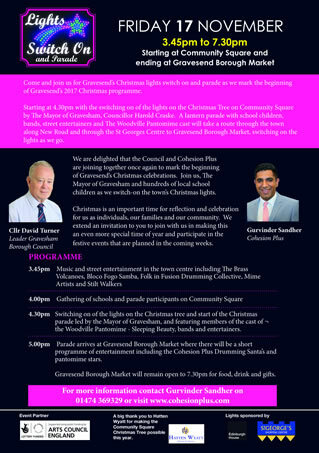 This will launch the Christmas celebrations in the borough and we hope the local community will come out to support us on Friday. A lot of hard work has taken place in the build-up and we believe it will be an excellent showcase of how the arts can bring communities together to celebrate all that binds us together in the Town regardless of faith and background. Schools taking part in the celebrations are, Cecil Road Primary, Holy Trinity Primary, Ifield School, Kings Farm Primary, Painters Ash Primary, Riverview Infant Junior School, St Botolph’s Primary, St Georges Secondary, St Johns Primary, and Westcourt Primary. 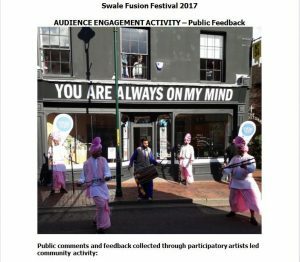 The event is funded via Cohesion Plus, who received a Grant Award from Arts Council England, Kent Equality Cohesion Council and Gravesham Borough Council.